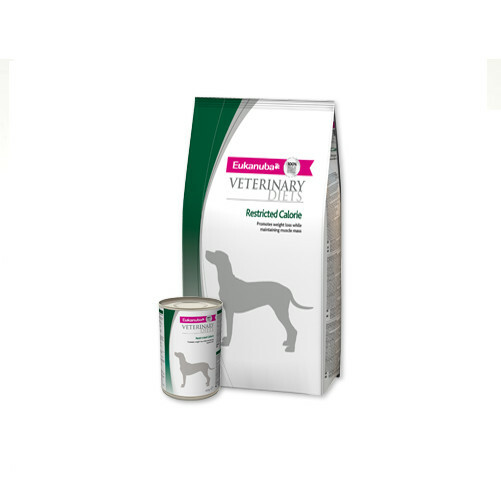 Feeding Eukanuba Veterinary Diets Restricted-Calorie™ formula is a great way to achieve the appropriate weight. This formula utilizes the Eukanuba Optimum Body Approach™ for trimming fat and maintaining muscle, and promotes gradual, sensible weight-loss. Restricted-Calorie™ is the ideal weight-loss formula for obese dogs or cats and should be used in combination with behavioural management and, where appropriate, an increase in physical activity. Individual target weight is determined depending on pet and breed. When dieting, the optimal weight loss is 1 to 3% weekly. For best results, both diet and a sensible exercise regime should be established. Recommended For: Weight issues. It is recommended that a veterinarian's opinion be sought before and during the use of this product in order to determine the needs of your dog. Maize grits, Dried Chicken and Turkey, maize, sorghum, barley, dried beet pulp, chicken digest, fish meal, dried whole egg, animal fat, brewer’s dried yeast, potassium chloride, sodium hexametaphosphate, fructooligosaccharides, linseed, glucosamine (475mg/kg), chondroitin sulphate (45mg/kg). Chicken, white fish, chicken liver, rice, maize grits, chicken byproducts, beef by-products, fish meal, dried whole egg, dried beet pulp, potassium chloride, linseed, calcium carbonate, monosodium phosphate, sodium chloride. Below are some recent questions we've received regarding Eukanuba Veterinary Diets Restricted Calories Dog Food, including answers from our team. How many calories in 400g can of veterinary diets dog food please?? Our sago has been prescribed this and also told to count calories and this can doesn't tell us!! Each 400g can has 1009 Kcal.